Using lanterns for your wedding centerpieces is a simple way to add elegance to your guest’s tables. They can be decorated with many different ornaments to fit pretty much any theme. Using LED candles allows you to be creative since there is no fire risk. The variations are almost endless. In this post, you will find lantern styles for all tastes, tips on how to save money decorating them and also by buying in bulk. 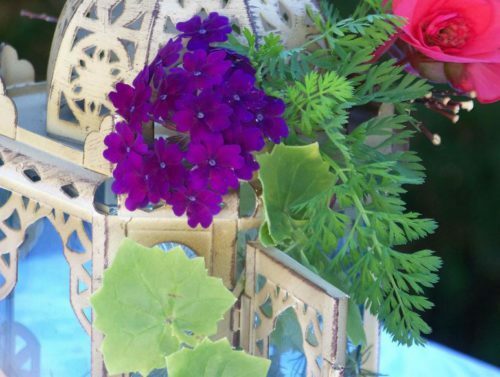 The price of decorating your lanterns with flowers can be a lot cheaper if you pick the right flower varieties. It also mainly depends on the number of flowers you’ll need, multiplied by the cost of the lantern and number of lanterns you’ll need. Some lanterns can be really expensive. Keep in mind that you need many of them to decorate all your guest tables. Fortunately, you can buy in bulk and save lots of money from trustworthy online retailers. Once you know how many lanterns you’ll need to make the design you have in mind it’s time to look at for the deals. Sure, you may wait for an eventual season sale or you can take advantage of buying in bulk. The best way to save money is to look for packs of 10 to 15 units or more if you need that much. Don’t only base your decision on your first impression. Some lanterns can look plain and uninteresting but they offer more creative potential and are often less expensive. See for yourself with following lantern packs. Lanterns come in many sizes, shapes, and colors. A popular trend these days is to create table centerpieces out paper lanterns. It’s one of the cheapest ways to make a lantern wedding centerpiece. If you are wondering what is the best type of lantern for your wedding centerpiece you can choose one related to your theme. 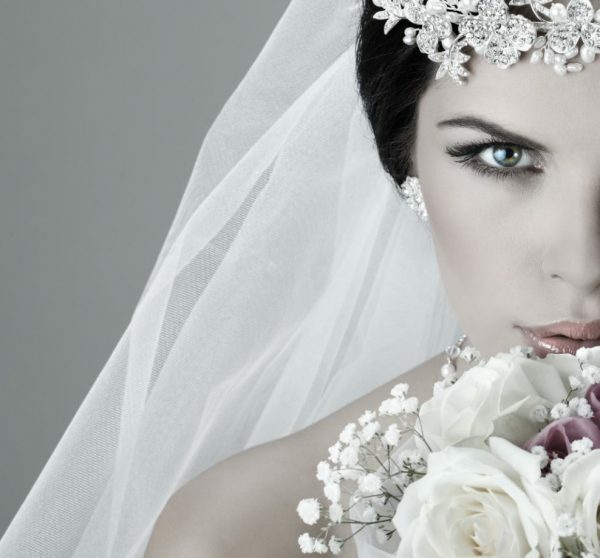 A classic design that matches most wedding themes. You can decorate it easily by adding flowers and foliage through the design holes. The color is elegant and classic. The top of this lanterns has a shed style tin rooftop that complements well an outdoor or rustic theme wedding. These are great to add contrast to white and pastel colors that are traditionally used to decorate wedding tables. 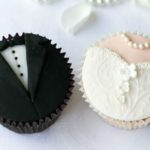 Perfect for a black and white theme wedding. Moroccan style lanterns have the particularity of being beautiful to look at with a daylight and spectacular when lit during the evening. The designs on it project flickering light with amazing patterns all around them. A treat for the eyes! What I like about this lantern are the beautiful allover patterns. It projects a softened light through the small apertures creating dancing shapes on the floor, walls, and tables! 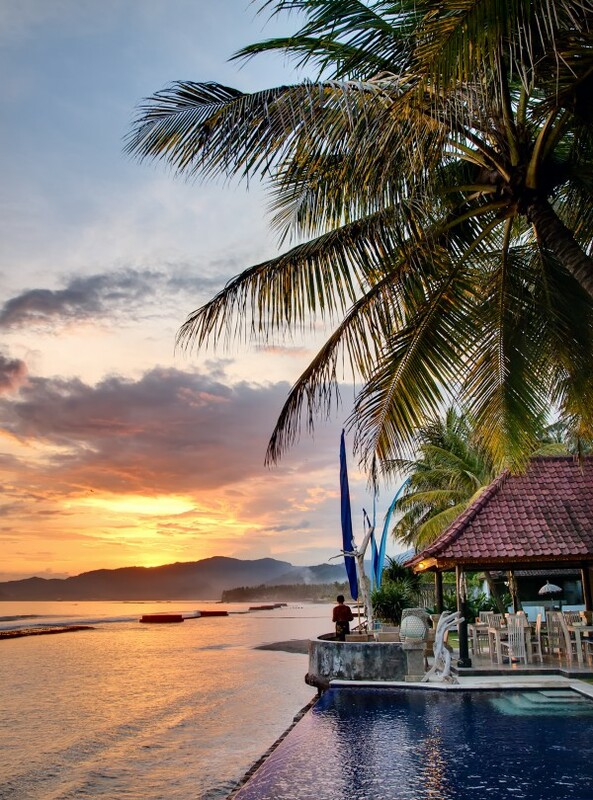 It makes a beautiful and warm atmosphere. Notice the engraved foliage details on the glass. Perfect for small tables. It’s no secret that you can buy wedding centerpieces online for much less than it would cost to buy from a regular storefront. Also, I know from experience that making your own wedding centerpieces is cheaper than renting them. There are many reasons to take advantage of the online merchant’s inventory. One of those reasons is that large retailers offer a huge and diversified choice of items in a variety of colors and sizes. 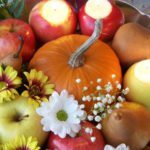 In my opinion, the best way to maximize your savings is to buy items you can combine to make your own unique centerpieces while benefiting from online savings. Here are some wedding lantern theme ideas. French country style objects have this candid and romantic charm that is just perfect for a wedding. Dominating colors are white, ecru and pastel colors. Fortunately, finding these online is easy and they provide an old fashion elegance and lightness to any decor. This vintage looking lantern with worn white paint and rusty finish is just the perfect item to represent this theme. Creating gorgeous wedding by the sea table centerpieces is easy and doesn’t have to be expensive. Cotton rope, drifted wood, lighthouse lanterns, or urchin tea light holders are only some of the sea treasures that you can use. The visual effect is simply stunning. A one of a kind lantern the will warm your guest’s heart. The previously shown wedding lanterns are offered in 10 packs or more which results in lower prices. For example, a lantern sold at $15 the unit can cost $10 or less when buying them in bulk. The more you buy the more saving you make. In other words, if you need to decorate 10 or more tables than I suggest that you take advantage of wholesale prices. Once you’ve picked your favorite lantern style, it’s time to apply the final embellishing touches. In the next section, I will present a floral decoration idea but you can also have a flowerless centerpiece that will look just as stunning. To decorate your lantern without flowers simply place your lantern at the center of a branch wreath or a faux foliage garland for modern looking lantern wedding centerpieces. The lantern can also be filled with different size beads or faux moss. You can also hang crystal strings inside the lantern with an LED tea light for a beautiful shimmering. Finally, a very easy way to decorate your lantern without flowers is to simply fill your lantern with an LED light wire and a piece of tulle without compacting it. Add in some sparkling paper confetti with the shape and color of your liking for even more brilliance. Some flowers tend to be more expensive than others depending on where they are grown and how easy it is to cultivate them. If you want to save on flowers pick blooms that are easy to find in the location and in the month you are getting married. Prices of these flower varieties are lower since transportation and maintenance (watering, refrigeration, storage) fees are lower for the seller. Note that I removed the flower’s stems so that their color and refined beauty stand out more. Foliage can be a good way to fill the spaces and make the arrangement look lush without spending a fortune on flowers. I suggest choosing flowers that have vibrant colors and not more than 3 or 4. You can also choose flowers that catch the eye like hydrangeas. They are pretty big, though. Just make sure to place them at the bottom of the lantern or in a way that doesn’t hide other visual aspects of the centerpiece. The foliage I used is wine-like Lophospermum, silver artemisia and… Carrot leaves at the top of the lantern. Carrot foliage is visually interesting, isn’t it? I love paper lanterns because they are versatile. You can suspend them above the dance floor but you can also use them as a wedding table centerpiece to create a diffuse light. I’ve seen many wedding table designs with a plain white paper lantern centerpiece and flowers at the bottom. The look is elegant and at the cheapest price possible. 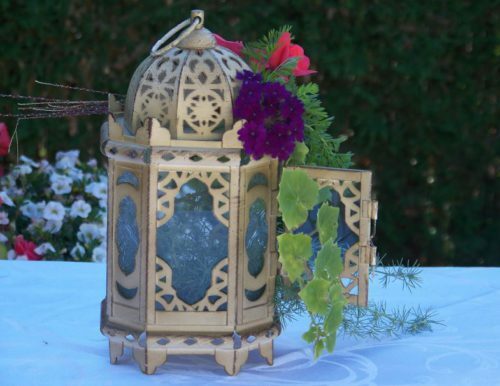 Here are 3 more ways of using lantern for wedding centerpieces with LED lights. If you want something unique, try using different sizes and shapes together. Many paper lanterns are now available in a cylinder or square shape for a modern looking design. Giant paper flowers make a beautiful wedding table centerpieces. You can turn them into an ambiance light source by hiding a LED wire through the petals following the circular pattern of the flower. If the center is flat you can simply put the battery powered candle in the middle. You don’t even need to add lights to make them look impressive. Just display the flowers over a rectangle table as a table runner for a stunning look. If the venue has a suspended ceiling and allows you to suspend decorations than you definitely should suspend the table centerpieces. Plus, medium to large size centerpieces can block your guest’s vision. Therefore make sure to find a convenient height for the center table decor as well as for any suspended centerpiece. Moreover, use them as a backdrop for you and your guests to take pictures. Attach small LED balloon lights inside and you’ll have a charming evening lighting. I’ve also seen round paper lanterns like these used as centerpieces with a cute greenery garland place around the basis. You can accessorize them with pretty much anything. Hope you enjoyed these cheap lanterns wedding centerpieces ideas and that you have a better idea of how this can look in your own wedding celebration. This website is filled with affordable decor elements and simple DIY projects to help get the best bang for your buck. So have a look around and see for yourself. Finally, if you have any questions or want to share your thoughts you can do so by leaving a comment. One of the benefits of buying online is the recurrent discounts and deals. In fact, some merchants offer regular wholesale prices and others provide lower prices on a seasonal basis. Other sellers choose to liquidate there stock to make some room for new products. Also, many home and event decor companies sell at a lower price than the competition on a regular basis. Yep, you read it well, sometimes, there are no rebates or offers but prices are still lower than in an actual storefront. Like many people you probably got a quote from the venue’s affiliated decoration company to rent your wedding centerpieces and other decoration elements for a wedding celebration. More often than not renting is more expensive. If time is on your side you will be able to wait for the deals and find what you really want instead of choosing what’s left. The greatest benefit of buying in a storefront is that you can look and touch the product, pay for it and leave with it. However, storefronts sell their items at a higher cost. The truth is, running physical store results in more expenses than running one online. That’s why the same products are sometimes consistently higher priced than they are on Amazon for example. It’s also the reason why many storefronts are transferring their mercantile activities exclusively online. But that’s another story. What this all means is that either way, you’re in for big savings. Have You Found Inspiration Yet? 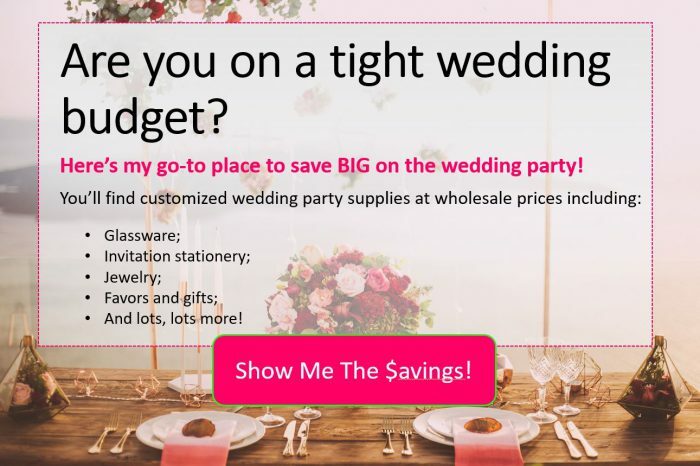 The Internet offers plenty of savings opportunities when it comes to wedding related items like fashion and decor. However, if you plan to buy wedding centerpieces online (or anything else for that matter) make sure you choose a trustworthy merchant. I personally always read past buyer’s review and questions and answers before buying anything from them. This information helps you grasp their level of satisfaction concerning, product quality and respect of the delivery schedule, warranties, etc. If there are no reviews available for a specific item, note that a good merchant will also answer in a timely manner any potential customer’s inquiries. So don’t be shy to ask questions directly to the vendor. I hope you enjoyed the previous ideas. Please feel free to ask a question or leave a message in the comment section bel0w.